sunday survey: who’s your man? 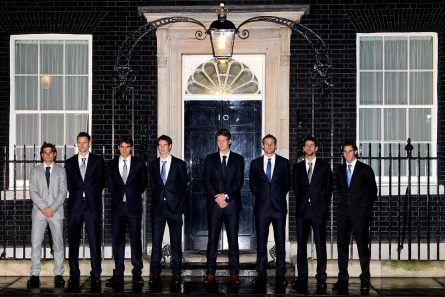 The men have already kicked off the final week of the ATP Tour calendar for 2010 at the ATP World Finals in London. Andy Murray has made easy work of Robin Soderling while Roger Federer does battle with David Ferrer later tonight. Who do you think is set to end the year with a bang? Wilson has a new video out that seems to be poking a little bit of fun at Head (twice!) and Roger Federer after their recent watch-this-amazing vids surfaced online – and we love it. The break-dancing themed vid has a tennis player dancing, spinning and hitting the ball to an opponent who surely must be a little motion sick from their battle. We know you’ve all been waiting for this since the US Open and thank god – is god Srdjan in this situation?! – and it’s finally (FINALLY!) arrived. Just promise us, you won’t spend all of your Christmas money on these babies. At least save some for the China Open store. 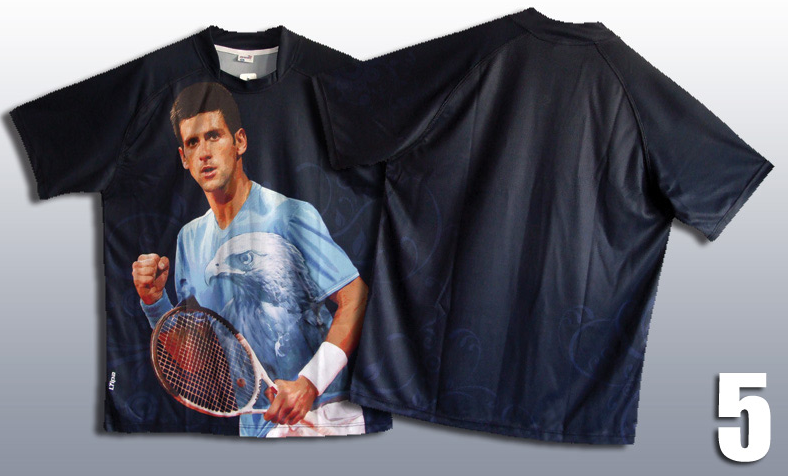 Novak, No Shirt Needed: The TSF vault is good for those moments when no tee is needed. 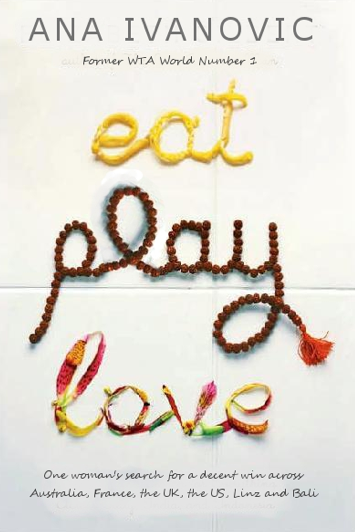 To celebrate Ana Ivanovic‘s victory in Bali, we thought we’d release the cover of her new book, Eat Play Love. Everyone knows what an affable, sweet girl Ana is, and now you can read about her journey to find herself – and her game – across five continents. sunday survey: would you rather? Four big-time tennis events are taking/ took place today. Where would you most like to sit down to take in the action in person? For just the second time in this year, Andy and Jamie Murray are joining forces this week in Valencia on the doubles court. The Murray clan took out Feliciano Lopez and Fernando Verdasco in the opening round of play 6-3, 7-6 (3). Doubles draw here. The two were awarded a wild card into the event, marking the first time they’re playing double together outside of their home country since Madrid in October of 2008. The two paired up often early in their careers, even making a final together in Bangkok in 2006. 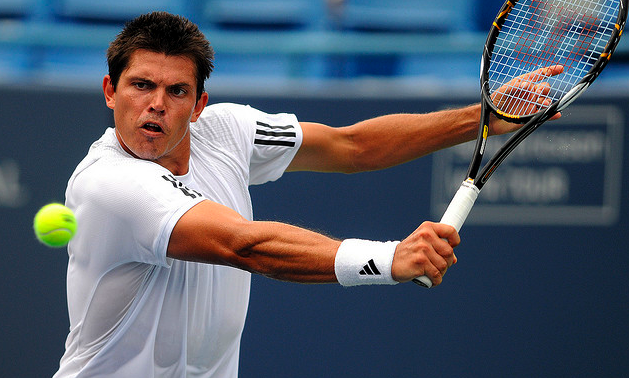 But as Andy’s singles career exploded, he played less and less dubs, pairing every so often with big guns like Greg Rusedski, Tim Henman, Lleyton Hewitt and Novak Djokovic. Jamie Murray has also had a variety of partners, but mostly has settled on Jonathan Marray, a fellow Brit in 2010. The Murray-Marray duo floats their ranking around no. 90 in doubles these days. 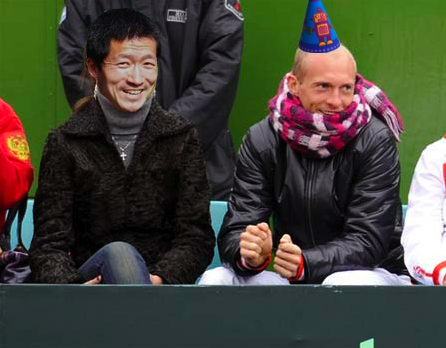 None of these three gents, Andy, Jamie or Marray have taken the court for the British team in Davis Cup doubles in the last two years, though Andy and Jamie teamed up for one win at the 2008 Beijing Olympics. 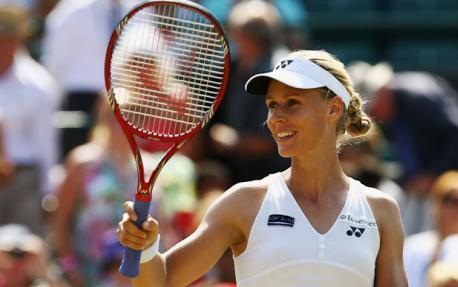 Elena Dementieva is waving good-bye to the WTA Tour after a dozen years on the tour, which saw her greatest moment in 2008, at the Beijing Olympics. But while Dementieva might be most well-known to tennis enthusiasts as the greatest chica never to nab a Slam, you can bet she will be a missed force on the tour. No one else played with such maturity and poise, and even the shaky serve was made up for by that blazing forehand. Can you remember an Elena diva moment? Neither can I. I got the chance to watch Elena in person this summer – and if you never had the chance to watch this girl up close, I’ll give you one descriptive word: athlete – and she was a joy to watch. 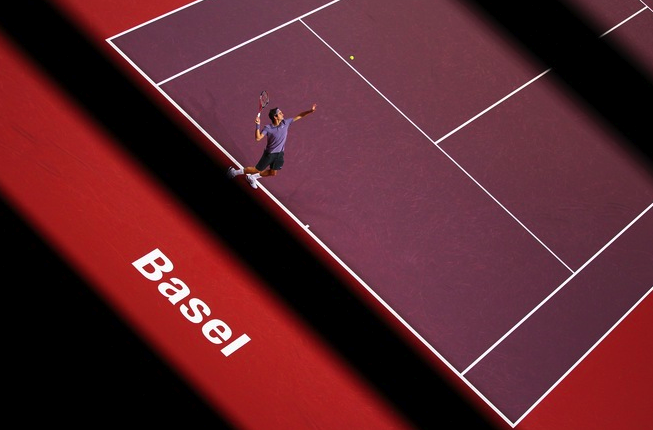 The tennis may have been flawed at times, but the heart was always there. Can’t wait to see what comes next for the Muscovite. Survey study: Of the 158 folks that responded to our Sunday Survey, 38% said they thought Elena would announce she’s pregnant come Thanksgiving. OK, riiight. 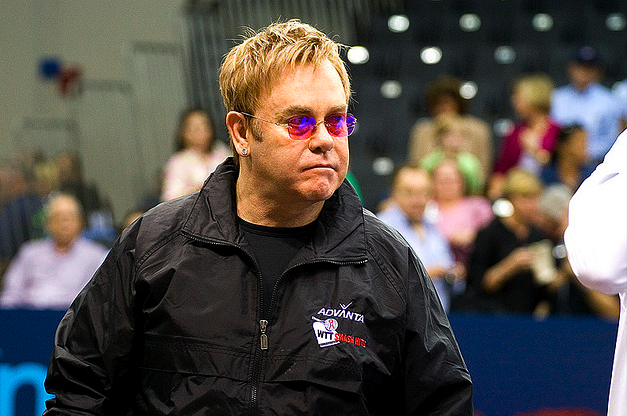 Courier calls: A variety of responses sprung up from the naming of Jim Courier as the new US Davis Cup coach last week. Greg Garber was questioning the call already over at ESPN.com, while L. Jon Wertheim was giving the nod to the Courier appointment in his Monday post this week. Our call? Well, we’re not so sure it matters who captains. Wertheim pointed out that four Americans sit inside the top 22 (Roddick, Isner, Fish and Querrey), and while the time may have passed for Roddick and his Davis Cup days, the Bryan Brothers look committed. 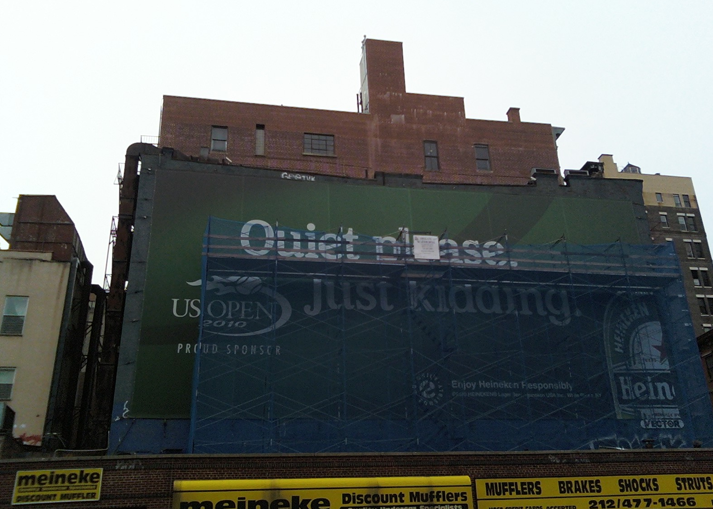 The bigger question is: what will the Isner, Fish and Querrey era bring? Those are the boys that seem invested as Courier takes the reigns. Retirement footnotes: While Elena’s announcement shocked a few and left others unsurprised, Serena Tweeted and blogged her well wishes to Dementieva, who had a 5-7 record against ReRe. Of course, retirement of one WTA veteran meant that the media was curious about her counterparts, namely Kim Clijsters. And here’s a curious fact for you: Lindsay Davenport, who shaved off Elena in her first big-bang match in the 2000 US Open semis still is not listed as retired on the WTA web site. Comeback likely? You never know with the mom next door. Back on the winning (and publicity) track: Winning his first match in five tries, Fernando Verdasco found his winning form (most recently displayed in heroics at this year’s USO) in Valencia Monday. The Slice had some good shots of Fernando charming the masses at a Calvin Klein event last week in Madrid (with his pants on), before heading east to Valencia. He also appeared on the Spanish cooking show, El Hormiguero. Jealous of that cooking-show host? Yes, so are we. Frame this: Ipek Senoglu is probably the most famous tennis player you (and I) have never heard of. Senoglu is Turkish and reached a career-high ranking of no. 293 back in 2004. While her career has mostly run its course, Senoglu has been instrumental in building tennis’s popularity in Turkey, which will host the WTA’s year-end event in both 2011 and 2012 in Istanbul. Oh, and she’s a looker, that Ipek, too. Above: Ipek in what we think is the Turkish/ Eastern European version of Bazaar. Can anyone help us out on translating?